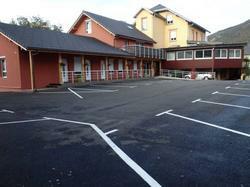 Set on the outskirts of Chambéry, this hotel offers guest rooms with an LCD TV and free Wi-Fi access. Savoyard specialities are served in the restaurant and Chambéry Train Station is 6 km away. With a 24-hour reception, the hotel also offers reflexology massages upon reservation. Private parking is free on site and La Feclaz ski resort is located 22 km away. There is a spa just 1 km from the hotel.